Love Marie Ongpauco, better known as Heart Evangelista, is a well-known and well-loved Filipina celebrity, model, TV host, and a fashion & beauty icon. But, what people don’t know about her is that she is an avid fan of art. She is, in actuality, a visual artist and a good one at that. She came out as a visual artist in 2014, and she garnered both good and bad reviews for pursuing her craft. She didn’t mind her critics and chose to continue doing art. Because of her perseverance, she became an accomplished painter with several solo exhibitions under her belt. She had sold out solo exhibitions both at the Ayala Museum and Galerie Joaquin in the Philippines back in 2014. Her third solo exhibition made her the first Filipino artist to showcase her works at Chan Hampe Galleries in Singapore. Since she was young, she loved painting. It started out only as a hobby, and she did not think it was going to be a lucrative job for her and a passion she wants to pursue her whole life. But, now, she is making a name for herself through her artworks. Evangelista changed the way we think about art. She uses canvas and oils to express herself. But, Evangelista also challenged the traditional idea that art can only exist on canvas. 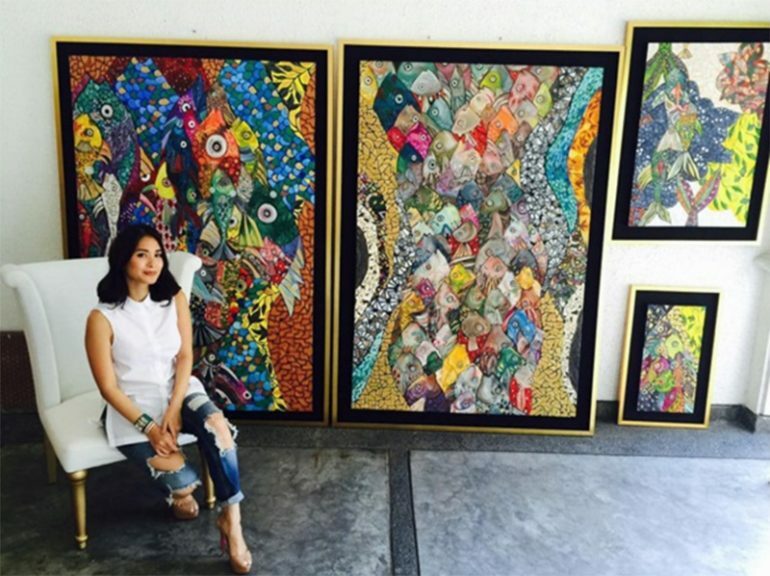 She proves that art can exist in many forms as her artworks can be seen in luxury bags, couture, and books. Heart Evangelista gained extensive media coverage when she started painting on luxury bags such as Chanel, Hermes, Louis Vuitton. It started out when she accidentally stained one of her luxury bags while eating cheese fries. Evangelista took it to the professionals to have it cleaned and restored but, everyone said it was impossible to fix it. Then, she had the idea of painting over it. It turned out to be a big hit and a lot of her friends commissioned her to paint their bags as well. 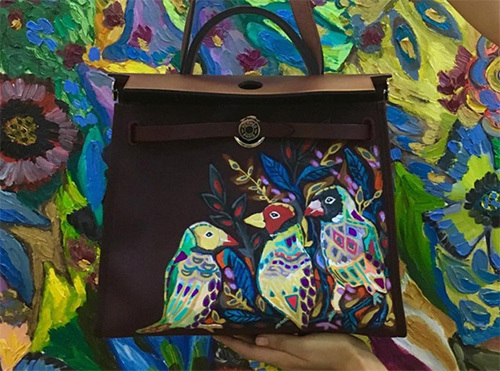 She garnered many local and international clients and gained a reputation for being able to transform luxury bags into high art. Heart Evangelista is now making her clothing and fashion line, hand-painting her art in skirts, accessory bags, and gowns. In 2016, she even had a collaboration with a Philippine-based designer Mark Bumgarner and produced many high-end couture gowns with her paintings on them. She showcased her works of art in an exhibition entitled “LMxMB: when art meets fashion”. Evangelista was also asked to do illustrations for the children’s book “Daughter of the Sun and the Moon,” written by Rocio Olbes. In 2016, Evangelista collaborated with Arnel Patawaran who produced a poetry book called HaiNaku and other poems. In this art project, Evangelista was commissioned to generate the cover art for the book. Evangelista’s inspirations draw heavily from art heavyweights such as Gustav Klimt and Pablo Picasso. Gustav Klimt, better known for his artwork, The Kiss, was an Austrian symbolist painter. Klimt’s primary subject was the female body. Her other influence, Pablo Picasso, was a Spanish painter who was considered an influential figure primarily for being a founding member of the Cubist movement and co-inventing the idea of collage art. Both of these artists’ influence is evident in how Evangelista produces her art. Looking at Evangelista’s work, we can understand the complexity it takes to create her masterpieces. She painstakingly puts in intricate details that breathe life into them. 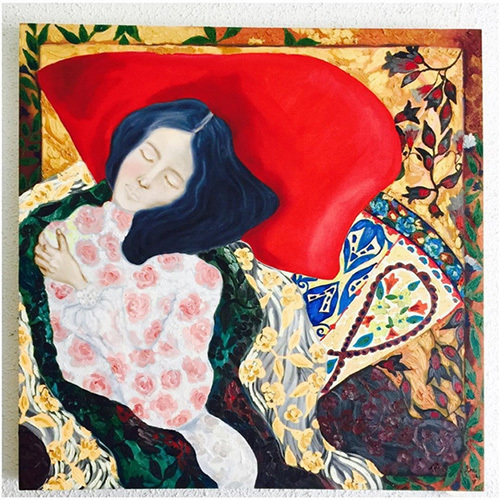 Women, flowers, and birds are the three key subjects that Evangelista likes to paint. Because of her attention to detail, it takes her two to eight months to complete a commissioned artwork. Now, Evangelista is still perfecting her technique, honing her skills and growing as a visual artist. Her newfound dedication to her craft inspires many people to pursue their own passion. She is truly a gifted artist to look out for in the coming years.